The trouble with the creepy kid subgenre of horror films is that kids are not inherently scary. The prospect of having one certainly is. See also: being near children and being forced to say nice things about other people’s offspring. As a villain however, they are pretty easy to beat – just make them listen to adults talking about mortgages or take them on a long car journey. 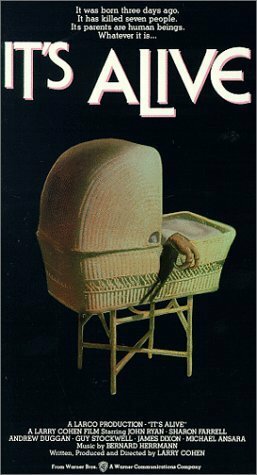 Larry Cohen’s It’s Alive takes this even further by making the child a newborn. It is literally fresh out of the womb when it embarks on its killing spree. Considering most newborns can’t even support their own head, it is quite the prodigy. A serious threat it ain’t, but despite the films posturing, the child isn’t meant to be. This is what sets It’s Alive apart from other child killer films; while they feature parents slowly realising their child is a monster, It’s Alive is about a father realising that the monster is actually his child. The film follows Frank (John P. Ryan) and Lenore Davis (Sharon Farrell) who are expecting their second child. Lenore goes into labour and promptly gives birth to a tumour with teeth, who then goes on a killing spree. Despite the many dated elements of the film, there is something compellingly modern about the way the couple are thrust into the spotlight and forced to publicly conduct their grief and anguish. Much of the film’s tension comes from Frank trying desperately to tow the party line and prove to himself and others that he loathes the creature just as much as everyone else. And as for the creature - well, far be it from me to blaspheme the great Rick Baker, but it is lucky we have the title to tell us that It’s Alive. Like so many child actors, the baby hasn’t aged well. Baker’s creation was used sparingly by Cohen due to its large size and lack of mobility. Luckily the rest of the cast are much more vibrant. Ryan’s journey from grieving father to protector of the innocent is what the film hangs upon. While Farrell is given very little to do as Lenore (this was the seventies after all), the steel she displays when confronting Frank makes the character more than just a cartoonish overprotective mother. Overall however, the film is as bumpy and uneven as the mutant baby. It’s Alive has zero production values, yet a rather impressive score from the great Bernard Herrmann. It has a few isolated impressive sequences, such as the chaos post-birth, but the death scenes feel repetitive and bland. There is a black streak of humour running though the film, such as when a large group of cops surround an innocent baby, guns pointed, yet this doesn’t sit comfortably with the drama at the centre of the film. Too light on monster to be a creature feature and too heavy on drama to be a straight up exploitation film, Cohen’s It’s Alive really is a mutated creature all its own. While it can’t quite make a compelling villain out of a newborn, it can wring some original drama out of its afterbirth.